Grassroots donors like you are at the very core of abortion funding — as are our clients. So, as we close out 2016, we want to tell you about Tye, one of the hundreds of clients we worked with this year, who generously shared her story with us. Tye’s words underscore how important our supporters are, and how much of a difference your contributions make in the lives of each of our clients. As you read about her experience, please consider making that difference today with a donation to NYAAF. I’m originally from New York, and I currently reside in Georgia. As a 40-year-old proud mother of three going through a divorce, when I missed my period, the furthest thing from my mind was pregnancy. I’d been with my husband for seven years, and nothing had happened outside of our daughter. Since I was turning 40, I honestly thought I was going through menopause. I’d never been 40 before, so there’s no blueprint! I’d started working out and doing 5 miles a day, joined a boot camp, and could see my body slimming down, except this one area, which I could never get right. Overall, I was still trying to mentally grab my hands around the fact that what used to be my life was no longer my life. But I laid down here one day and I just felt something. I thought it was gas. And at that point, the light bulb went on. I guess I was in denial for quite a bit, and I’m just saying to myself, “No this can’t be, there’s just no way. Scientifically, it doesn’t make sense.” So I decided to go to the doctor. Sure enough, the furthest thing from my head, was it: I was pregnant. A lot of things were going through my mind, of course. In the situation I was in, there was just no way. No time is ever the right time, but this time was really the wrong time. Still, I wasn’t exactly worried. I knew I was paying for top-of-the-line insurance. Coming from New York, I know that women are allowed to have a termination up to 24 weeks. I just assumed that was what it was throughout the country. Perhaps that was rather ignorant, but that’s just what I thought. I called Kaiser, my health insurance, to get the authorization for me to go to the nearest facility. Everything was going as planned, until they did the sonogram. It turns out I was past the state limitation in Georgia. Immediately I was very sick. They gave me a list: Maryland, New Mexico, Colorado, Texas, or something like that. All places I’ve never been. I was 21 weeks, not what I was expecting at all. If anything, I was counting back from maybe 3 or 4 weeks. So again, yes, I’m thinking of all kinds of things. It’s a very emotional thing. This is very traumatizing for a person because you’re beating yourself up, “What did I do?” You’re literally googling things on how to miscarry on your own—you’re just thinking of ways of how you can correct this. I have no family here, and there’s no way I’m going to go to New Mexico or Colorado or any of these places; where would I be going? So I said, “OK, I’m going to go New York. I work every day, I have insurance, I should be ok. I have this money that comes out of my salary so that I’m well taken care of when I need it the most.” I called the insurance company and they said I do not have coverage outside of Georgia. But Georgia regulations say I can’t do it in Georgia. Considering the state regulations, you would think that if I needed to go to another state it would still be covered, but no, that wasn’t the case, no was no. There was no compromise, there was no human interpretation. Then the New York Abortion Access Fund (NYAAF) was recommended to me. I was going to fly to New York from Georgia, on the next flight. When I was going to New York, the price I was given was just for 21 weeks. Each additional day was an additional charge. I was given a price of $3000, of which I was going to cover $800, and I was approved with NYAAF for the balance. So I went to the facility, and I was told it went from $3000 to about $6000—I think it doubled. I got sick again, because this was it, I had no other resources. When I had gotten the first approval, I immediately started crying tears of joy because I did not have any other options. So when I found out this was doubled, I just knew there was no way I could cover this excess amount. I spoke to my case manager, Ryan, again, and he said he’d talk to NYAAF’s Board of Directors to see what could happen. So I basically left the facility not knowing what was going to happen. At that point, I had my mind set, like I guess this is it; I’m going to have to tell my family what’s going on and this is what it’s going to be. I was basically forced to have this child. Ryan called me in the middle of the night, and told me he got the new approval. I started crying again. I couldn’t believe it. I just couldn’t believe it. This organization I knew nothing about actually saved my life. There was no lengthy process, no paperwork that needed to be filled out. I guess I just couldn’t believe that it existed. And to be quite honest, I’m still in awe. I’m never ever going to forget this. I am definitely indebted for life to NYAAF, so I needed to share my story. I don’t think many people understand how traumatizing the whole experience can be. They say, “How could you not know you were pregnant?” There are some cases where you really just don’t know, innocently, because there’s no way I could put myself through all that I went through, when I could have resolved everything sooner, without having to pay for airfare and hotel lodging, and everything else that it took for me to make this happen. To me, it was a life or death scenario, that’s how serious it was. So when Ryan called and told me that I got the approval, I broke down and cried on the phone, because it was a life or death situation. I worked with [NYAAF Volunteer Case Managers] Rachel and Ryan, and they were both sensitive to my needs and heartfelt. They worked quickly, and were very attentive. I was left thinking, “This person is actually going to try to help.” And again, I had no other place to turn—all of my trust was basically on this other person who was on the other end of the phone who I knew nothing about. It just saddens me that more women do not know that NYAAF exists. Not to take advantage of it, but just to know that there are organizations out there to really help you when there is no one else—when you feel like you’re forced to have a baby because of insurance and state regulations. My life depended on whatever NYAAF could do for me. And that’s how I felt. And they came through. Words just don’t express the amount of gratitude that I have for the donors that actually take the time out to think about others and donate to the organization. There are people that are very grateful. I’m one of them. Wholeheartedly grateful. Thank you. Thank you very much is all I can say. If I could do more, I would, because they need to know that they do save people’s lives. I don’t know how many people are grateful for what you all do collectively, but the statement that you’ve made in my life is definitely profound; it’s unforgettable. Unforgettable. That’s really my story. Two years ago, I found myself looking for a volunteer opportunity with an organization that was truly effecting change around reproductive justice. I was excited to find exactly what I was looking for in the New York Abortion Access Fund, whose mission is to support anyone in New York State who is unable to pay fully for an abortion. As someone who works outside reproductive health and politics, but who knows the very real ways that lack of access to reproductive health services can shape one’s life, I was eager to get involved in an organization that makes a direct impact on people’s lives. As a NYAAF intake volunteer, I respond to those who call or email us in need of assistance with the cost of their abortion. I work primarily with clients who only speak Spanish. Many of these clients are undocumented; I can hear their voices tremble when they leave a message on an unknown telephone number for an organization that claims it can help. Imagine being in that position, and having to trust that the person on the other end isn’t trying to scam or hurt you. It’s an anxiety that no one should have to feel while simply exercising their right to obtain a safe abortion. NYAAF trains its volunteers to work compassionately with clients, so that instead of being another barrier, we are a partner working alongside them to meet their needs. Since many of you will not hear their gratitude firsthand, I am here to tell you that it is profound and immeasurable. We could not do this work without the support of our donors, and that is why I am writing to you. Like our clients, I hope you will put your trust in the work that we do, and that you will donate to NYAAF today. Your tax-deductible gift will make an immense difference in the lives of our callers, who deserve to access the healthcare they need with dignity and respect. This year NYAAF had a record-breaking year; we pledged over $140,000 on behalf of over 400 clients with the help of donors like you. It is truly inspiring, and I feel honored to be part of the NYAAF family. We have raised nearly $17,000 towards our $60,000 end-of-year goal- can you help us support even more callers in 2017? On behalf of all of us at NYAAF and our clients, THANK YOU for your commitment to making safe abortion accessible for everyone. I joined the NYAAF Board of Directors in 2015, and I can sincerely say it’s been one of the most fulfilling experiences of my life. As a public health practitioner, I’ve been conducting sexual and reproductive health research for nearly a decade. At this critical juncture for reproductive justice, it’s meant so much to be deeply involved in an organization that directly helps individuals get the abortion care they need. This year, NYAAF pledged over $140,000 on behalf of over 400 clients, making 2016 our most impactful year to date. This past year, we as a Board also recommitted ourselves to being part of a larger movement toward social justice, recognizing that protecting access to safe abortion is a critical component of advancing social, racial, economic, and gender equity. We created and strengthened ties within our large network of allies, whether it was to champion fair wages, advocate for the safety of immigrant mothers and children, or to harness the collective power of abortion funding. I feel uncertain about what this next year will hold for our country, but I do feel certain of this: we will continue to give strength to each other as we fight for the health, safety, and dignity of all. 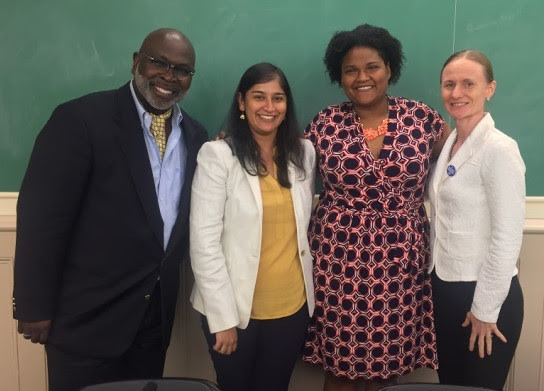 One of my proudest moments this year was representing NYAAF on a panel organized by Physicians for Reproductive Health, alongside esteemed reproductive justice advocates Dr. Willie Parker, attorney Jeryl Hayes, and Dr. Anne Davis (all pictured below). Our discussion reminded me that in our current sociopolitical climate, when so many individuals struggle to pay for the care they need, funds like NYAAF are essential to keeping abortion safe and accessible. This is why we need your support more than ever. Paneling with some reproductive health superstars! I hope you’ll consider joining me to ensure that NYAAF can meet the ever-growing need for our help. Will you support us as we strive to meet our$60,000 end-of-year fundraising goal? Every tax-deductible donation supports our ability to keep abortion safe and accessible for those living in or traveling to New York. On behalf of my fellow Board Members, our incredible cadre of volunteers, and our clients, thank you so much for your continued support. 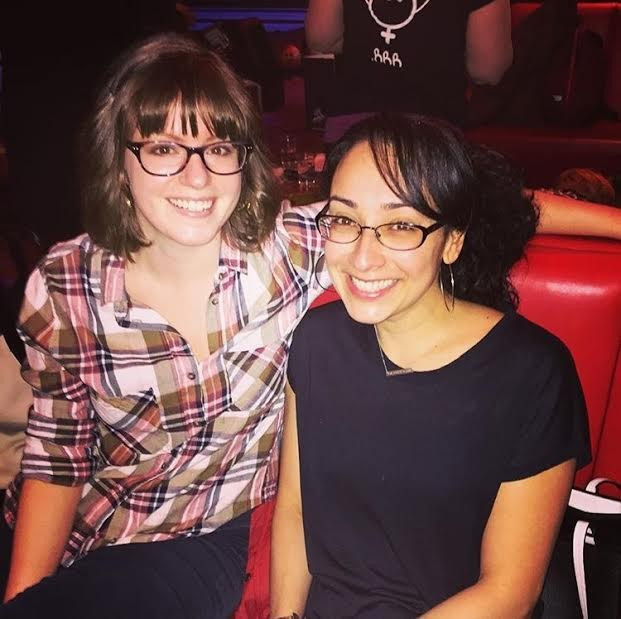 Volunteer to be a NYAAF case manager! Thank you for your interest in becoming a NYAAF case manager! NYAAF’s intake case managers are dedicated volunteers who help manage our intake helpline and work directly with our clients to ensure they have the funds they need. Intake involves a commitment of one week at a time, during which volunteers staff a hotline, return calls to clients and reach out to clinics to make pledges on behalf of our callers. Please fill out this short application by January 8, 2016 to be considered for our next training. Be sure to not skip any questions and to answer all questions thoroughly as we’d like to get a strong sense of who you are and your commitment to reproductive health/justice. This event has limited capacity. Your RSVP does not guarantee a spot, we will contact you and confirm your registration via email by January 18, 2016 with details and location information to confirm your attendance. For those we couldn’t fit in the training this time around, thank you so much for your interest, and don’t fret as we will be conducting another intake training soon. Please look out for other volunteer opportunities with NYAAF! Today is #GivingTuesday, a day dedicated to giving back. This year more than ever, we recognize the need to give back to our community, and to ensure that New York remains a safe haven for individuals seeking abortion services. In the wake of this month’s election, it is clear that we will face renewed attacks on our mission to ensure abortion access. While New York State has strong protections surrounding abortion, many of our clients travel from other states where access is much more limited, and it is our mandate to support them. What the New York Abortion Access Fund (NYAAF) does is simple: we fund abortions. We can’t do that work without our amazing volunteers staffing our hotlines, and we can’t do it without your support. We are an all-volunteer organization with low overhead costs, which means that your donation goes directly toward helping individuals seeking abortion services. 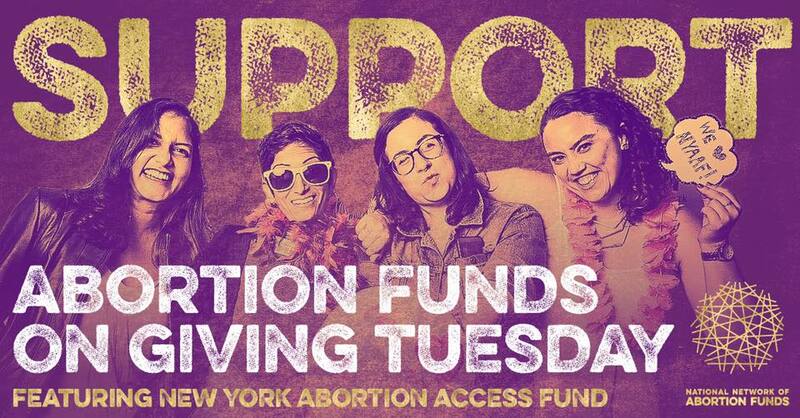 You can send a check made out to the New York Abortion Access Fund to FDR Station, Box 7569, New York, NY 10150. You can support us while doing your holiday shopping by choosing NYAAF as your charitable organization of choice on Amazon Smile. This year, our goal for #GivingTuesday is to raise $60,000. Your support this holiday season will help us keep abortion accessible to anyone living in or coming to New York. Click Here to Support NYAAF Today! Call for new Board Members! More info and application link HERE! The New York Abortion Access Fund is proud to fund abortions as part of the fight for reproductive justice for New Yorkers and for all–and we want you to join us! 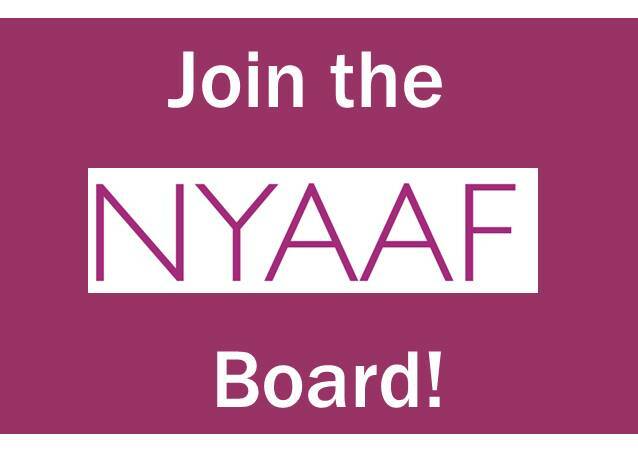 NYAAF is seeking new additions to its all-volunteer Board of Directors. We are soliciting applications for specific Board roles as well as “at-large” Board Members. No prior board experience is necessary; the main requirements are a commitment to our mission and values, leadership skills or potential, excellent interpersonal skills, and enthusiasm for working as a team. We expect applicants to be able to attend monthly board meetings (virtually or in person), and encourage a commitment of 2+ years of service on the Board. We seek diversity in identity, perspective, and experience, including diversity in race, ethnicity, age, economic status, educational experience, status as a parent, ability, sexuality, gender identity, national origin, religious perspective, professional and career experience, and in accessing healthcare. We also hope to create leadership opportunities for those who have historically been excluded from the reproductive rights movement, including people of color, trans and gender-nonconforming people, young people (18-25), and those who have experienced difficulty in accessing necessary healthcare. For more detailed information, please read our Call for Board Members. The Application can be emailed to us along with a resumé or list of relevant experience. The deadline for submission is October 11, 2016. Email us at applications@nyaaf.org with any questions! THANK YOU, THANK YOU, THANK YOU! 7th Annual Bowl-aThon was a huge success! WE DID IT! Over the last few months, 310 stupendous bowlers surpassed all our expectations and raised more than $137,000 — which sets a new record for NYAAF and the National Network of Abortion Funds! We’d like to extend our most heartfelt THANKS to all of you who fundraised your hearts out these past weeks and brought all that awesome reproductive justice spirit to the NYAAF Bowl-a-thon on Sunday. We had a great time, and hope you did too! In particular, we’d like to honor the RU 4-86ing Abortion Restrictions or What? for bringing the most impressive costume flair – what’s not to love about those Ruth Bader Ginsburg likenesses? We’d also like to congratulate The Pills for being the top fundraising team, having brought in more than $17,000 in donations! Some lovely NYAAF canvas tote bags await them. Finally, we want to extend our warmest thanks to bowler and longtime NYAAF supporter Barbara Kass, who was the top individual fundraiser and who had the most unique donations for the 2016 Bowl-a-thon. We’re thrilled to award Barbara with 4 Super Vouchers to the American Museum of Natural History here in NYC. We look amazing! Despite lighting challenges! Don’t forget to thank your donors! We’d love their support in years to come, so send those thank you notes and emails! The Bowl-a-thon site stays live through the end of April, so follow up with those stragglers who promised donations but didn’t get to it yet! Treat yourself to something amazing for doing such great work for abortion access! PIX! Do you have awesome photos of you and your team? We’d love to see your best Bowl-a-thon pictures — feel free to tag us on Instagram (@nyaafund),Twitter (@NYAAF), or Facebook (New York Abortion Access Fund), and use the hashtags #NYAAFbowl16 and #bowl16. If you won a raffle prize but did not claim it on Sunday, please email nyaafbowlathon@gmail.com so we can get your prize to you! We can’t thank you enough for being such FIERCE, FUN, and PHENOMENAL advocates for safe abortion access. We’re already looking forward to bowling with you again next year! SPECIAL THANKS go to the volunteers on our Planning Committee: Dory, Jessica, Julia, Maureen, Sonia, Nicole, Michelle, and Sara. Your hard work on this event was INDISPENSABLE. Thank you so much. Update on Cyber Attack: We Remain Resilient! As some of you may be aware, the National Network of Abortion Funds experienced a cyber attack last week. As a result, the Bowl-a-thon website is temporarily down. Additionally, you may have received an email yesterday that appeared to come from the National Network of Abortion Funds (NNAF) that contained anti-choice propaganda. We believe this harassment is part of a targeted effort by anti-choice bullies. NNAF is working tirelessly to resolve the issue.They’ve let us know that they believe that beyond email addresses, no personal information has been compromised. We will keep you updated as we receive more information. It is obviously upsetting to be the target of this kind of attack. Yet it is a reminder of why we must work so hard to make sure that abortion care is accessible to everyone. We won’t be stopped by cyber attacks, or by those who seek to restrict abortion access. NYAAF remains resilient. The Bowl-a-thon website is still down, but until it goes back up, you can show your support by donating at the NYAAF website. Will you stand with NYAAF and donate today? Thank you all for your ongoing support of NYAAF and our work — as bowlers, donors, volunteers, and more. We wouldn’t be able to do this work, and remain strong in the face of challenges like these, without you. Hey hey, bowlers!! You might have noticed that we’re just $5,518 shy of our new fundraising goal of $130,000. We are floored at what you and your communities have been able to do to help NYAAF continue to serve those needing abortion services in New York. If each bowler raises just $20 more before tomorrow, we will reach our goal! Let’s do it, and then celebrate BIG on Sunday! WHEN AND WHERE TO FIND US. As a reminder, the event is from 11 AM – 1:30 PM this SUNDAY, APRIL 10 at Bowlmor Chelsea Piers, at Pier 60/23rd & W.Side Hwy, New York, NY 10011. This PDF map can help orient you to parking/pickup/dropoff areas nearby. The venue opens right at 11 AM, and we’ll be ready to check you in as soon as you arrive! CANCELLATIONS OR NON-BOWLERS ON YOUR TEAM? So we can optimize your team’s lane assignment, please email us *ASAP*at nyaafbowlathon@gmail.com if you know that you or one of your registered teammates will not be attending the bowl-a-thon, or will not actually be bowling. OFFLINE DONATIONS? WE’LL TAKE ’EM! Please bring any cash and checks you’ve received as part of your fundraising and we’ll get them processed — we’ll happily accept credit card donations onsite as well! BRING BOWLING-READY SHOES. Since we are close to hitting capacity at Bowlmor Chelsea Piers (way to go! ), there’s a chance they may run a little short on bowling shoes. Just in case, we’d love it if you’re able to bring or wear shoes with light-colored rubber soles — especially if you know you’ll be arriving on the later side. PRIZES PRIZES PRIZES!!! We’ve got lots of great raffle prizes waiting for you! You’ll get your raffle tickets when you check in, and you’ll then have until 12:30 PM to put your tickets in for drawing. The winner of each prize will be drawn separately, so you can allocate your tickets however you like for the items you really want. Be sure to check back at the raffle table after 1 PM to find out if you won! NEED SOME MORE PRO-CHOICE SWAG IN YOUR LIFE? We’ll have some snazzy tees and tanks made especially for the 2016 Bowl-a-thon up for sale! HASHTAG LIKE IT’S GOING OUT OF STYLE. Your amazing team names are serious indication that there’s going to be some incredible spirit coming at us on Sunday — we even have prizes for the team with the best costumes. We’ll be posting photos of all your awesome bowling flair, but we’d love to see your great shots, too! Hit us up on Twitter, Facebook, or Instagram, and feel free to use that #NYAAFbowl16 hashtag liberally. QUESTIONS? As ever, feel free to email us at nyaafbowlathon@gmail.com, and check our Facebook event page for any essential day-of updates. Can’t wait to see you Sunday! Join us for NYAAF’s 7th Annual Bowl-a-thon! 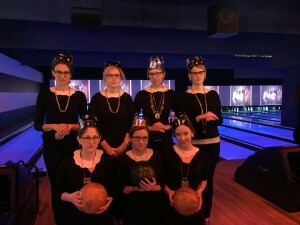 It’s time for the New York Abortion Access Fund’s annual Bowl-a-thon! Every April, abortion funds all over the country host bowling extravaganzas to raise money to protect abortion access for all who need it. Can we count on you to put on some bowling shoes and come out for abortion access? Last year, NYAAF broke the state and national record and raised more than $125,000! That’s right — thanks to the stellar energy and fundraising efforts of our bowlers, and the generous support from donors near and far, we were once again the #1 abortion access Bowl-a-thon in the country! We need your help to make the 2016 Bowl-a-thon even better!! This year’s Bowl-a-thon is on Sunday, April 10, 2016, at Bowlmor Chelsea Piers (Pier 60 // 234d Street and West Side Highway, New York, NY). In addition to bowling, there will be a raffle, prizes, food and drinks, and a spirit of collective action as we gather as a community committed to reproductive justice. Get your friends, families, colleagues, or community groups together, form a team, and register to bowl with us! Got some extra team spirit? Register as a team captain! No team? No problem! Register as an individual and we’ll match you up with other awesome bowlers. We can’t wait to fundraise and bowl with you! Support NYAAF and meet other reproductive rights and bowling enthusiasts as we strike down barriers to abortion access!